In Central Asia, Kyrgyzstan has long been considered as the ‘island of democracy’. In fact it’s the only country in the region that that has come close to holding free and fair elections. On the 15 October 2017, Kyrgyzstan held presidential elections that marked a milestone for the country. For the first time since independence in 1991, power changed hands in Kyrgyzstan peacefully. Such trends might indicate that the country is gearing towards greater democratiszing processes where people can generally gather to peacefully express critical opinions. Yet, contrary to these observations, recent incidents indicate that the country is sliding towards authoritarian tendencies. Such trends have been particularly visible in the freedom of expression where government’s growing pressure on independent media groups led them to file suits against major media outlets in the country. Earlier this month, Temir Bolotbek, a 38-year-old professor at the Kyrgyz State University of Construction, Transportation and Architecture, has been charged under an article of the Criminal Code that sets a maximum penalty of seven years in prison, for his critical comments on Facebook related to Soviet architecture. According to prosecutors his comments constituted an affront to ethnic dignity and instigating ethnic tensions. In March 2017, the Prosecutor General’s office filed three lawsuits — one against the local online media outlet Zanoza, and two others against Radio Azattyk, the Kyrgyz branch of Radio Free Europe/Radio Liberty (Human Rights Watch, 2017). In both these cases the Court found that the publication of articles was based on biased coverage and false information that directly affected the honor and dignity of Kyrgyzstan’s President, Almazbek Atambayev (Djanibekov, 2017). The Court further requested both media outlets to pay compensation totalling 32 million soms (US$462,855), and ordered the freezing of their bank accounts. On the 19th of December, the authorities further shut down the independent television station NTS known to be owned by Jeebenkov’s main rival, Omurbek Babanov. NTS was being broadcasted countrywide and was the largest private TV station in Kyrgyzstan. The repression on freedom of speech in local media further continued with the National Security Committee of Kyrgyzstan (GKNB) launching criminal cases against journalists daring to criticise the government. The authorities for instance launched a criminal case against the journalist Ulugbek Babakulov for the “provocative” article he wrote for Fergananews, which forced him to flee the country. The repressive media climate has further extended to foreign journalists and activists. On December 9th, the authorities in Kyrgyzstan ordered the deportation of the Central Asia correspondent for Agence-France Presse, Chris Rickleton, a British journalist based in Kyrgyzstan since 2010. He was expelled without explanation, leaving his wife and his young daughter in Bishkek. It’s important to note that the use of such practices is not unprecedented. In March 2017, the authorities expelled the Russian journalist Grigory Mikhailov working for the Russian Regnum news agency, and denied entry in 2015 to the Human Rights Watch researcher Mihra Rittmann. “The authorities have fabricated false charges against me and my husband, my family members were further subject to intimidation and harassment which included calls from unknown people”. (Interview with Leila Seiitbek, 20th January, 2018). On other occasions, the police came to pay her a visit to do some ‘random checks’. Finally the physical assault on her family forced them to leave the country. They fled the country in June 2016 by passing first through Khujand to Dubai, and then flew on to a European capital where they have applied for political asylum. Yet even when she is abroad, Leila is not at peace, as the Kyrgyz state authorities continue to exercise pressure on her family members left behind. 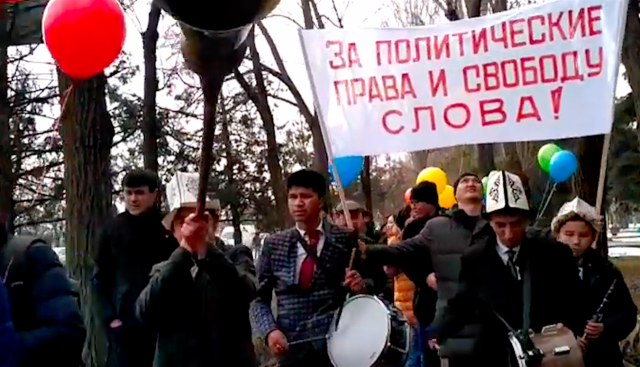 A public smear campaign in Kyrgyzstan through the National Television and Radio Broadcasting Corporation (KTRK) continues to target the family. The authorities have also issued a search warrant for Seiitbek and her family. To outsiders, Kyrgyzstan might look like ‘a beacon of democracy’ in autocratic Central Asia. The tiny mountainous country with its 5.7 million inhabitants might appear as an exception in maintaining its political freedoms in light of its neighbouring autocrats. Very few would have expected the country to arbitrarily deport international journalists, ban foreign rights workers or persecute civil society activists. Yet as the recent trends in this short article demonstrate, post-Soviet Kyrgyzstan is not so different from its autocratic neighbouring countries. Increasingly the country is adopting broadly similar patterns of authoritarian governance to its immediate geographic neighbours. Perhaps it’s time for Kyrgyzstan to leave behind its grand title of ‘island of democracy’ and for us to challenge its political realities. Radio Free Europe/Radio Liberty, 2018. В Бишкеке преподавателя судят за комментарий в «Фейсбуке». 20 April 2018. [Online.] Available at: https://rus.azattyk.org/a/kyrgyzstan-facebook-temir-bolotbek/29180554.html[Accessed : 15.05.2018]. RFE/RL, 19th December 2017. Kyrgyz Officials Impound TV Station Property Owned By Opposition Politician Babanov. [Online.] Available at: https://www.rferl.org/a/kyrgyzstan-nts-tv-opposition-babnov-officials-impound-property/28927074.html [Accessed: 25 April 2018].